You're the best! Around! Nothing's gonna ever keep you down! When I decide to pop out a mini me, The Karate Kid will be required viewing in our house. Sure, LaRusso can be kind of a tool. And he would've been turned into tonkatsu if Mr. Miyagi didn't show up that night after the Halloween dance when he wore that ridiculous shower get up. But nonetheless, he instills hope into the viewer and has us rooting for the scrawny underdog from Reseda. That's it, Daniel-San! Resist being put in Johnny's body bag! Paint that fence! Let Elisabeth Shue drive you around in that vintage yellow truck! The Karate Kid also created one of the greatest rivalries in movie history. There was Miyagi Do vs Cobra Kai. This was my first attempt at chocolate painting. I followed a super helpful tutorial on Eye Candy - thanks Jojo Krang! I think I've found my new obsession. I used semisweet and white chocolate chips for the larger areas and red candy melts for the wording and snake tongue. They were a bit tricky to work with. I had to move fast because the chocolate would harden before I could finish detailing each area, particularly over the white sections. Note to self for next time: upgrade to better chocolate. Oops. Lost a few of the dots. Must use more of the focus next time. I'll always be on Team Miyagi but you gotta admit...those Cobra Kai dudes displayed some serious passion in their dojo. What do we study here? THE WAY OF THE FIST, SIR! STRIKE FIRST. STRIKE HARD. NO MERCY, SIR! And if two actors were to procreate to make a clone of myself, who would they be? NICK LACHEY AND JOHN TRAVOLTA, SIR! Wow, cool! I love how your posts always make me go back and read them like 3 times while I scratch my head and say.. wait... no, wait.. so *how* did she do that? Wonderful wonderful wonderful! 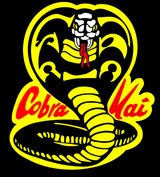 I ADORE Miyagi, down with cobra kai!!! Your chocolate looks amazing, and I am sincerely impressed by your dedication and disciprine (south park anyone?). Also, Mike's Little Mermaid reference made me lol. I love your sugared cinema posts! I try not to rack disciprine. Sensei Kreese was the worst, especially when he teamed up with that ponytail dude in Karate Kid III. I would've swept both their legs. You and I are definitely cut from the same Benneton Rugby, UG. How in the name of William Zabka did I miss th is post?!!! I saw the movie 2 weeks on a lonely Saturday afternoon and I cried. Oh, Mr. Myagi, you made this old heart cry. Sweep the leg! Also, that chocolate? To die for! I'm just now discovering what Johnny's real name is, thanks to you Margie. I wonder if Zabka likes babka. I wonder if he would pick chocolate or cinnamon babka a la Seinfeld? He would definitely pick chocolate. The better babka. Of course he would. He's awesome.